For more than 20 years, the West Texas Food Bank (“WTFB”) has been West Texas’ only provider of reliable, affordable food. The Food Bank serves the needy in two ways; first, they provide meals to more than 44,000 clients annually in their 19-county footprint. Secondly, they provide food to a network more than 80 non-profits, leveraging the wider reach of those partners. WTFB continues to purchase greater amounts of food, because greater efficiency in food manufacturing is reducing surpluses that used to be donated to food banks, and also because of increased demand, particularly in the Permian Basin area. The inflationary effect on rents as a result of the oil boom has driven many people, especially the longtime resident elderly, to seek food from WTFB and its partners. Elderly residents living on fixed incomes cannot easily survive as food prices rise. The Food Bank, with its affiliation with Feeding America, is able to negotiate cheaper prices on food, passing this savings along to its partners and expanding the reliable supply of free food to the neediest of West Texas residents. For more than a decade, the WTFB has recognized that the demand for its services far outstrips its ability to cope with that demand, that a new, larger facility would be required to meet growing needs. Census data reports that since 2000, the combined population of Midland and Ector counties has risen by more than 40,000 people, and the number of individuals served by the WTFB has grown in lock-step with the population increase over that time. The existing facilities are out-of-date, over-used, and under-prepared to serve hungry West Texans. Despite being hamstrung by inadequate facilities, WTFB’s impact on the community has nevertheless been staggering. In 2014, WTFB distributed over 5 million pounds of food, or 4.2 million meal equivalent, to people in need: 40% of whom are children, 16% are seniors, and 63% are Latino. Seventy-four percent of WTFB clients have incomes that fall at or below the federal poverty level, with 89% of client households having annual incomes of $20,000 or less. 17 of the 19 counties WTFB serves are rural, and most of their service area is a USDA Food Desert. Over 98% of the 418 US counties that are designated Food Deserts are rural, and are some of the poorest in the US. Rural food deserts not only face higher poverty rates, lower median incomes, and significantly older populations than other rural counties, but they also suffer from severely limited access to quality, affordable food options, resulting in an extremely unhealthy and impoverished community. Studies conducted in rural food deserts show that more than 45% of the population did not consume adequate amounts of fresh fruits, 67% did not eat enough vegetables, and 34% lacked adequate dairy in their diets. These populations must turn to smaller grocery stores that have a limited variety of quality foods and tend to charge higher prices. In July, 2016, WTFB and Crescent Growth Capital closed on a $6MM NMTC financing, utilizing $5MM in allocation from McCormack Baron Salazar and $1MM from US Bank, to finance to construct a new 11,150 square foot volunteer activity and program innovation center. 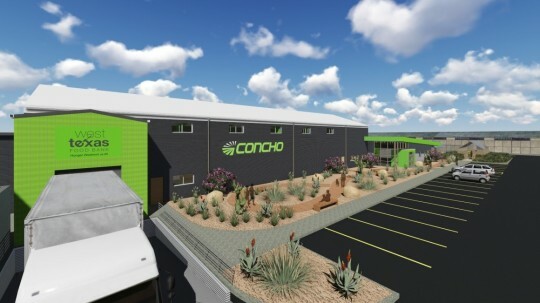 The nearly $6MM distribution center will feature 11,150 square feet of interior space and 7,000 feet in outdoor learning space, serving as the primary volunteer activity and program innovation center for the WTFB. The facility will add storage capacity as well, but more importantly, it will provide space to interact with the community, for classes covering topics ranging from basic nutrition and wellness to growing fruit and vegetables at home. Demonstration Kitchen – A fully outfitted home-style kitchen used to demonstrate appropriate cooking techniques to community members such as youth groups, SNAP recipients, people with health issues that bring with them with dietary restrictions, and many more groups who will receive instruction from food experts. Client Choice Pantry – Modeled after a convenience store, this room will have refrigeration and shelving that allows clients who need food to come in and select what foods they want. The Client Choice Pantry is available to first-time users; thereafter, clients are referred to one of the WTFB partners for ongoing service. Large Warehouse Area – The warehouse area is used for storing foods, and includes a freezer/refrigerator section of significant size, and will serve as a staging area, utilized by the many volunteers who serve as unpaid labor for the food bank. Community & Training Room – This room will be available for use by the community for meetings and conferences. It will be fully outfitted with audio-visual equipment to facilitate presentations so that appropriate learning can take place. Hunger Alleviating Trail – An outdoor learning space, the Trail will be planted with native plants that are edible, and other plants that can thrive in Texas’ arid climate. It will serve as a meeting place for youth groups and others to learn how to grow desert gardens. Earth-Bermed & Conventional Green Houses – An underground greenhouse will receive daylight but will be maintained at a cooler temperature to allow for a wider variety of plant life to blossom. An above-ground green house to grow winter vegetables during the cooler months.